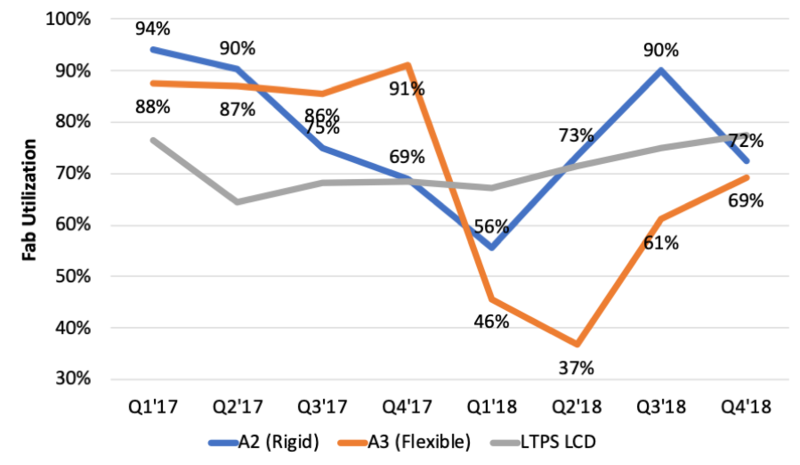 DSCC reported that OLED fab utilization recovered strongly in Q3, as Samsung’s A2 Rigid OLED line increased from 73% to 90% and utilization on Samsung’s A3 Flexible OLED line increased from 37% to 61%. Samsung’s A3 utilization dropped to 37% in Q2’18 due in large part to lower than expected sales of the iPhone X. The flexible utilization increased as Apple purchased displays for the iPhone XS and the XS Max, but recent reports indicate lower than expected shipments and DSCC shows a flattening of utilization growth. The A2 fab utilization reached as low as 56% in Q1’18, although the reason is not clear. Samsung has made a concerted effort to sell rigid OLEDs to a Chinese smartphone OEMs, OPPO and Vivo to help with the capacity utilization. Nonetheless, DSCC is forecasting a drop in the A2 fab utilization in Q418. DSCC is discounting reports of oversupply of LTPS LCD panels as they show fab utilization holding steady between 65% and 78%. For more info regarding DSCC’s Quarterly OLED Shipment and Fab Utilization Report, please contact info@displaysupplychain.com.